Will the state ask SRA to scrap the plan to include MNP in the Dharavi Redevelopment Project? That’s what activists want to know. Under pressure from environmentalists, citizen groups, activists and rival Shiv Sena, Chief Minister Devendra Fadnavis on Thursday said in the assembly that there would be no construction at the Maharashtra Nature Park (MNP). 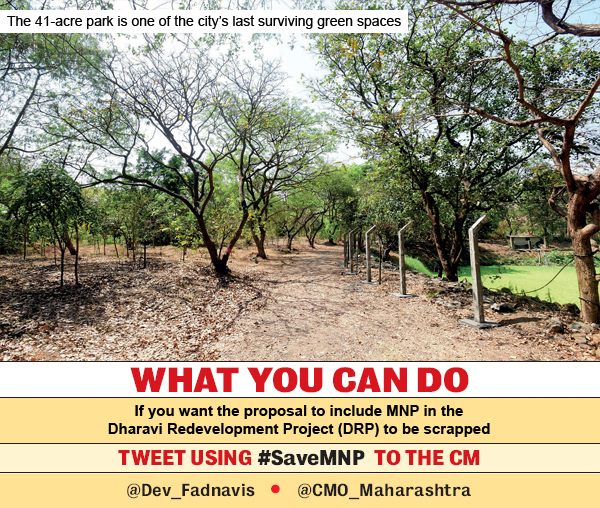 Instead, Fadnavis said, the MNP would be tagged as a natural area and its status as a green space would be protected. While a small battle has been won in the fight to preserve the open space, activists say it is not good enough. They have instead demanded that the proposal to include the MNP in the Dharavi Redevelopment Project (DRP) be scrapped. They are also afraid that the authorities will try and use the FSI of MNP to develop Dharavi. Will the state government ask the Slum Rehabilitation Authority (SRA) to scrap the plan to include MNP in the Dharavi Redevelopment Project? Will the notification issued on March 9, proposing inclusion of the MNP in the DRP be withdrawn? Will the MNP’s FSI be used for making additional units in the DRP? If there was no plan to have any construction on the MNP land, then why did the government want to make it part of the DRP in the first place? And if the CM doesn’t want any construction in the MNP and wants it to be tagged as a natural area, then why did he approve the MNP’s inclusion in the DRP? Why didn’t the CM-led MMRDA raise an objection to the SRA’s plan to make MNP a part of the DRP? Over the last three days, Mumbai Mirror has been reporting on the opposition to the proposal to use the 41-acre park in Mahim as part of the Dharavi redevelopment plan. “We have no such plans. No construction work will be allowed at the Mahim Nature Park,” Fadnavis told the legislative assembly. The issue was raised by Shiv Sena legislator Sunil Prabhu. “The confusion got created after the Maharashtra Nature Park was shown as part of Dharavi Redevelopment Project. This was done considering the proximity of the park to Dharavi. But the government has no plans to allow any construction at the park,” Fadnavis clarified. Shiv Sena leader Aaditya Thackeray too demanded that the SRA must scrap the proposal to include the MNP in the DRP. “This is a big win for all Mumbaikars. But if the CM really means what he says, then the original proposal must be scrapped. We must keep up the pressure,” Aaditya said. We are happy that the CM has said that there will be no construction at MNP but the entire proposal must be scrapped. The SRA or DRP authorities must withdraw the modification proposal. While activists have welcomed Fadnavis’s assurance, they now want the SRA to scrap the proposal altogether. “We are happy that the CM has said that there will be no construction at MNP but the entire proposal must be scrapped. The SRA or DRP authorities must withdraw the modification proposal. Unless that is done, the threat to MNP will always exist. Also, if the authority is planning to use FSI of MNP, we will oppose it tooth and nail because it will add density to the area. Consecutive governments may use that to develop MNP in future,” said Nayana Kathpalia, trustee of NAGAR, an NGO that works on open spaces.